During the weekend of April 27th, Black Lives of Unitarian Universalism is hosting revival in Kansas City, Missouri for Black UU and UU-adjacent folks in the MidAmerica region and beyond, and we can’t be thrilled enough to announce that, as of today, the registration and sponsorship opportunities for RECLAIM: A BLUU Revival are live! It is, as it has always been, our birthright as Black folks in our faith to be able to breathe deeply, to release fully, and to embody and RECLAIM wholeheartedly what is truest about our Unitarian Universalism. Revival, at its core, is a resurgence of something, a recovering of something that gives abundant life and unwavering hope at a time when those things might otherwise seem too far from our reach to even imagine the possibility of. Revival, for BLUU, is about revising and reimagining the commitment on the part of Unitarian Universalism to embody Beloved Community in a real, tangible way. Black religion and spirituality, in all its manifestations, has always gravitated toward a spirituality that makes us whole. So when we say real and tangible embodiment, we actually mean that. We want folks to know that we can show up in the (mostly)* Explicitly Black space of revival ready to receive the moment with all of our available senses, connections to spirit, and understandings of faith. We need to be able to be and bring our whole selves to this experience and recover what it means to cultivate Beloved Community in this political moment. Knowing that we can’t be whole people everywhere, we are absolutely going to be whole people at revival in April! In a faith where we regularly talk about and yield to the Spirit of Life, are we really listening to the fullness of that spirit in these times, Spirit as a living, breath-filled thing? Revival is about breathing life back into our very selves. It is the value of black life on its own terms. It’s about making something in the midst of the wilderness. Revival will give us a chance, across the broad range of faith, to yield to the fullness of life. And we are particularly excited and blessed to be able to do it with some incredible people who will be guiding us along the way, including the Rev. 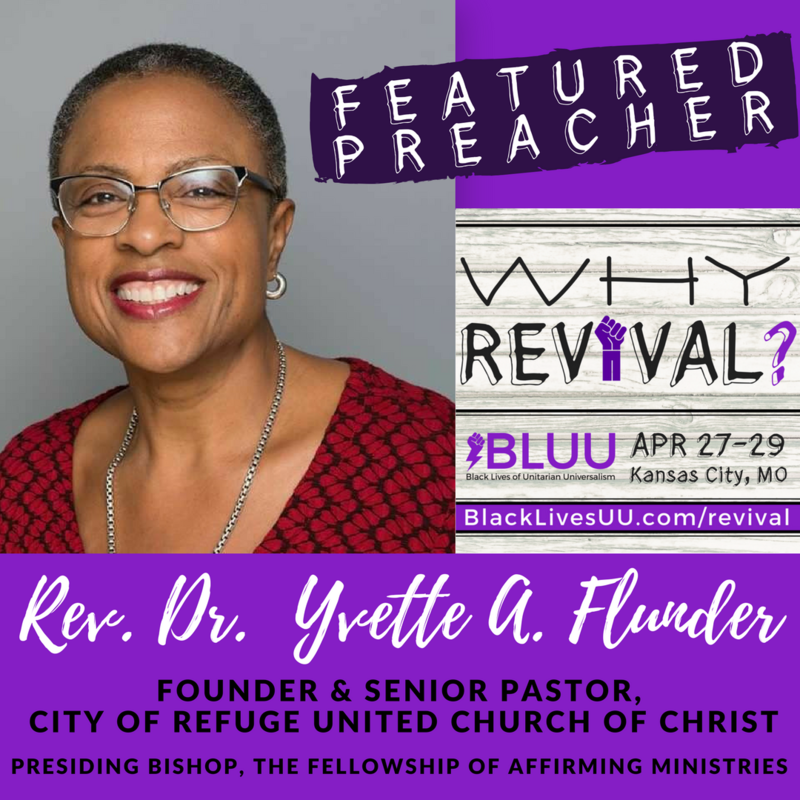 Dr. Yvette A. Flunder, who will be our guest preacher on Saturday evening! Bishop Flunder is the founder and senior pastor of City of Refuge, United Church of Christ, presiding bishop of the Fellowship of Affirming Ministries, and a trustee on the board of the Starr King School for the Ministry. Be ready to be transformed. Be prepared to leave different from who you were when you arrived. Believe in the power of our Black UU spiritual family to build a new way together! Register now! And we can’t wait to be with you in Kansas City!! While we will be hosting an explicitly black worship service Sunday morning at 9:30am, All Souls’ 11:15am service will not be explicitly black.